Born in 1972, Cathy graduated from Rhodes University with a BA Fine Art in 1994. Cathy moved to London in 1995 where she retrained in book design. 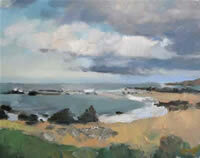 At the end of 2001 she moved to the remote North Norfolk coast where she began painting full-time. In the summer of 2003 Cathy was an 'invited resident artist' at the Painting School of Montmirail in SW France (near Toulouse) where she furthered her study of the great colourists of the Modern period; Bonnard, Cezanne and Matisse. In 2008, Cathy attended a workshop at Matisse's former home and studio 'Villa La Reve', Vence, France with the British abstract artist Gary Wragg. Cathy has lived, travelled and exhibited in London, Norfolk, France and Australia. 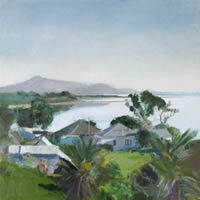 She returned to South Africa in 2008, and currently lives and works in Kalk Bay. 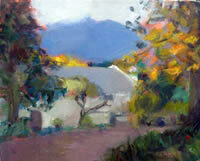 Cathy works in oil on canvas, and has been dubbed a gifted 'colourist'. Not afraid of the subfuse tones - the beautiful in-between greys - she demonstrates an impressive ability to orchestrate in a wide range of colour harmonies. Cathy often paints "alla prima", a technique rooted in Impressionism whereby the canvases retain a freshness that speaks of both an obvious pleasure in the sheer sensuality of paint and a visceral excitement before a living subject.